I received a reminder today of what photos I had taken exactly one year ago. Google does this, for reasons that escape me. All I wanted was a place to backup my picture files, but this is what you get when you join the big machine. However, it was synchronous with a thought I’ve had mulling in my head for some time, which is the phenomenon of pairs – the duality of things. When you get right down to it, everything started with a singularity, which was simply everything in the universe compressed into a point with no dimension. It had no dimension because there was nothing to measure with. Try to imagine the concept – it floors me, so I avoid thinking about it. Maybe Steven Hawking could have explained it to me, alas, but we shall never meet. So what happened? It expanded, fast. But, mathematically it had to go from being one thing to two, didn’t it? I mean if mathematics holds true in all universes, then the whole number that follows one is two. So I say that two is thus extremely important. With one, there was nothing, but with two there was instantly something, because the 2nd thing made the first thing a point of reference, before which there was none. Before this gets too confusing I just want to share some pairs of things that I have recently encountered, just because they were a pair. Some were alive, others man made. Here we have a pair of Smith Corona Sterling’s; a 1951 and a 1956 – one pica, one elite = a perfect set. Since I had collected a few of these, as wonderful as they are, I decided to sell them both. One sold in 2 days. The other just went on the market. What’s the point of having only one of them? So I have to sell the pair. I’m hanging on to my pair of Silent Supers however. A pair of Olympia SG1’s, both 1963. Both had the same problems – including a disintegrated right margin stop. How odd – clearly a design defect. One elite, one pica – is this a pattern? One sold, the other still for sale. The advantage of this pair coming along in short order is that I have had a chance to examine the engineering closely, since they both required a fair bit of tweaking. Buying and fixing these is not only fun, but also is a small contribution to keeping these great old machines from the dump. There are no repair shops left in this town, so when I get a typewriter back on the road I feel like I’m contributing something, and the money I make helps me buy and fix more machines, so I’m not out of pocket. Still, they are cheap when you think about what they are worth and what it would cost to buy one in today’s money. Now we move on to wildlife. 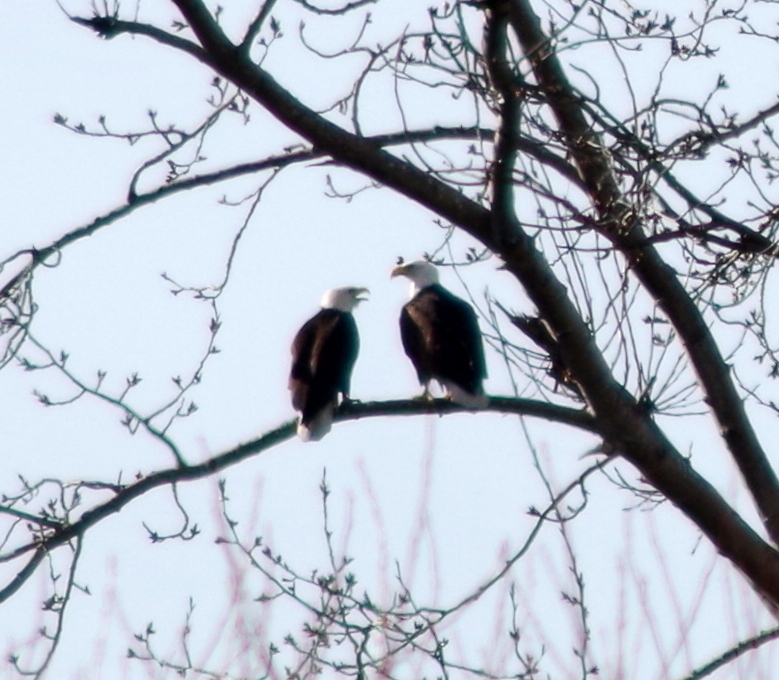 I always thrill to a pair of bald eagles. 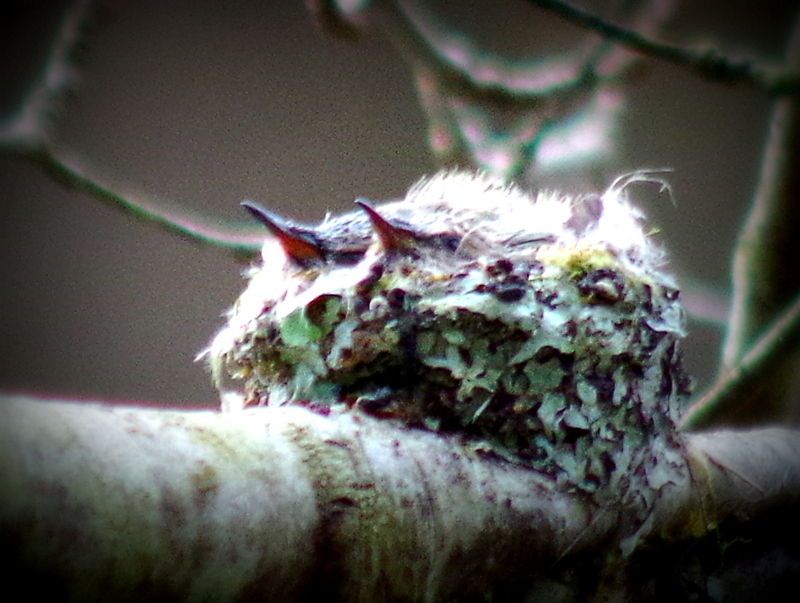 This pair was first encountered in one tree, then they flew away. Later on my rambles I saw them again in another tree. To see a pair of them take flight up close is a wonder to behold. I saw a pair of ducks we could eat! Moving on we find some ducks. 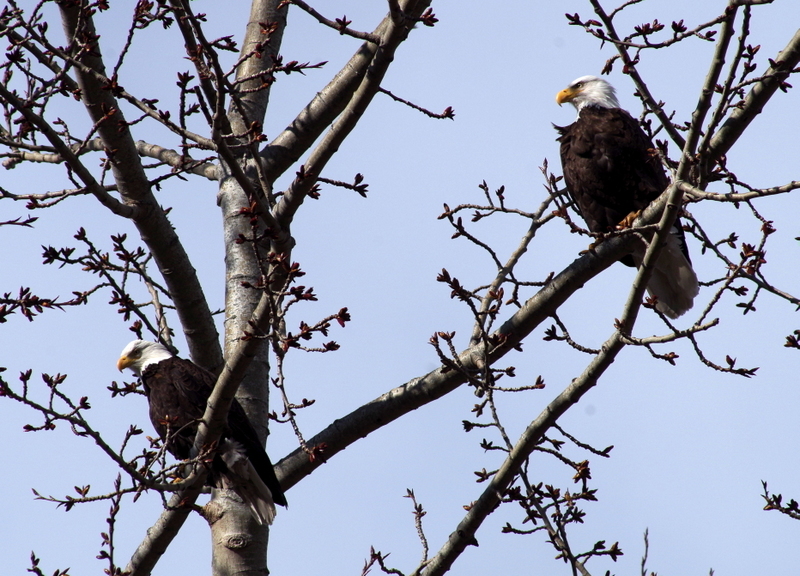 They tend to hang out in pairs, male and female, but I wonder if they form couples? I think not, but they say geese do.